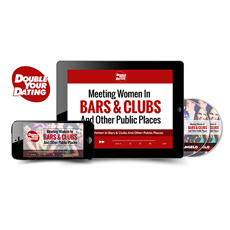 "Meeting Women in Bars and Clubs" is a program that offers step-by-step instructions on approaching women and starting conversations in a bar or club. "Not bad but Mystery Method is better"
It's a good product, David DeAngelo doesn't do bad stuff. There are better products on this topic. I like David DeAngelo and recommend some of his products. This one is good as usual, but on this particular topic (meeting women in clubs) I would say some other coaches know much better what they are talking about. You should check out Mystery Method for example, or even RSD if you like their natural style. DeAngelo is good at teaching attraction, conversation, etc, but for cold approaching he is not the best.